Actor Joseph Ruskin, longtime SAG board member, died Saturday of natural causes December 31. He was 89. 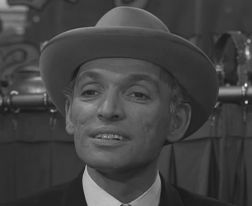 With more than 120 television credits in a career spanning six decades, Ruskin had a resume of sf/fantasy genre shows few could match, appearing in Twilight Zone, Outer Limits, Voyage to the Bottom of the Sea, The Time Tunnel, Star Trek, Land of the Giants, Rod Serling’s Night Gallery, Planet of the Apes (TV series), The Six Million Dollar Man, The Bionic Woman, Project U.F.O., Airwolf, Max Headroom, Star Trek: Deep Space Nine, Star Trek: Voyager, and Star Trek: Enterprise. His film work includes roles in The Scorpion King and Star Trek: Insurrection. He also did voice work in two Star Trek video games. I couldn’t let a year go by without a new issue of File 770 and, with creative help from Taral, John Hertz and John King Tarpinian, I managed to get one done just before the last page was torn from the calendar. File 770 #163 [PDF file] boasts Taral’s diplomatic memoir about his brief time as an artist for an sf publisher, a full LoneStarCon 3 report from John Hertz, and Martin Morse Wooster’s account of Readercon 24, the first one since It Happened. This is an especially good a day to visit to Bill Burns’ eFanzines site. The latest three zines to be posted, besides my own, are Robert Lichtman’s Trap Door #29, Steven H Silver’s Argentus #13 — and Journey Planet #18, guest edited by Helen Montgomery, where anonymous contributors say what they think about the effects of social media on fandom. 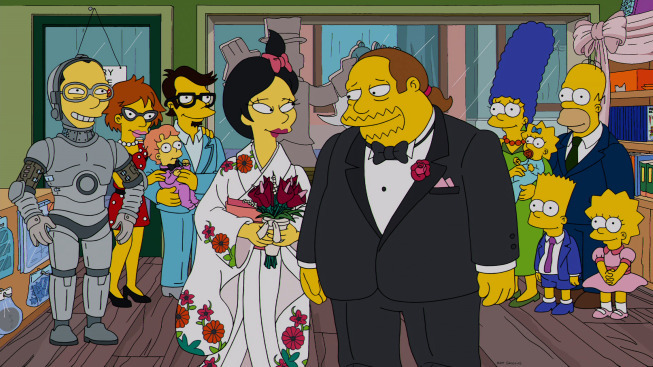 Harlan Ellison and Stan Lee voice their own characters in The Simpsons episode “Married to the Blob,” airing Sunday, January 12. 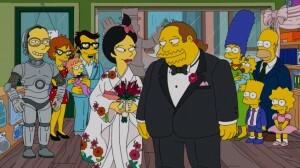 Ellison said earlier this year he appears in a scene with show characters Milhouse and the Comic Book Guy. Stan Lee, reports Entertainment Weekly, “swings by Comic Book Guy’s store and doles out some advice on comics, romance, and, yes, romance comics”. How idiocyncratic is Christopher Campbell’s list of the 13 best sci-fi and fantasy films of 2013? Here’s your first clue. His number one film was actually released in 2009 – it just took him four years to get around to seeing it. Disregard any stigma attached to the found footage idea (even though this film makes the best reasoning for that idea since the climactic fight in Chronicle), and Europa Report is an easily enjoyed and constantly chilling interplanetary mission movie about a crew traveling to the titular moon of Jupiter, where there seems to be signs of life. This smart, modestly budgeted yet perfectly realized effort should be the antidote for all who hated Prometheus (I love both, actually), as well as to all the bloated sci-fi movies we got from Hollywood this year (including another co-starring Sharlto Copley), but it still doesn’t seem to be catching on as the sleeper hit it ought to be. Having been a fan of director Sebastian Cordero for a while, I can only wish this is at least a stepping stone to him becoming the Ecuadorean Alfonso Cuaron. Very interestingly, The History of Future Folk co-director Jeremy Kipp Walker was a producer on this very different kind of sci-fi film. I’ve been conditioned by the movie You’ve Got Mail to assume any announcement made by a bookstore around Christmastime will be a sad one. But not this year! Greenwich Village’s Strand Book Store reported record sales on the Monday before Christmas. “Yesterday we had our best sales day in the history of 86 years at the store. So thankful for all of you,” the bookstore tweeted early Christmas Eve. By John King Tarpinian: Sometimes you get lucky. I happened to be going over to my neighborhood bookshop, Mystery and Imagination, to show them an article in the current Los Angeles Magazine, which just happened to have a quote by Guillermo in it. 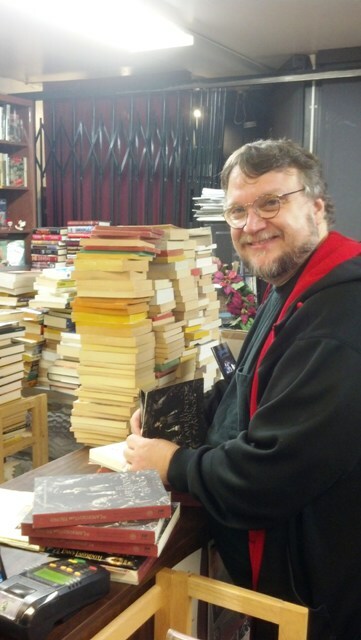 As I was in front of the bookshop there was Guillermo, he waved at me, we shook hands and came into the bookshop. He was home for Christmas, taking a break from his duties in Canada. While Guillermo was in the shop he took the liberty to sign a couple dozen books of his the shop had in stock. More copies of his newest book, Cabinet of Curiosities, a set of the new Penguin Horror series he edited and some first editions of The Strain. The Strain was one of the things he has been working on in Canada. One of the nicest men you’d want to meet. AbeBooks’ 25 Most Expensive Sales in 2013 include four Bibles, Shakespeare’s works in French, poetry from Emily Dickinson, handwritten spell-books and classics from Charles Dickens, J.K. Rowling, William Golding, and Frank Herbert. First edition from June 1997 – one of the 500 copies printed. A 1954 first edition with its dust jacket. Written under the text of the half-title “for Angharad Ryder from William Golding with best wishes.” Loosely inserted is a hand-written envelope from Golding with a hand-written postcard inside, “Dear Miss Ryder, Yes Lord of the Flies is the alleged translation of Beelzebub. I will sign your Nobel Speech if you send it. Yours sincerely William Golding.” Also included are two hand-written letters from Golding to Ryder. Published in 1922, first US edition of one of the first modern picture books for children. Signed first edition published in 1965 by Chilton. This copy was complete with the first issue dust jacket and the $5.95 price on the front flap. Two spiral-bound books of spells handwritten in the 1960s by a high priestess of Wicca called Persephone Adrastea Eirene, an American witch of Swedish and English ancestry who led her own coven.